A Microservice-based architecture divides software systems into many small services which can be deployed independently. Every team works on its own Microservices and is thus decoupled from other teams. This allows to easily scale agile processes. The modularization into Microservices protects the system against architecture decay. Consequently, systems based on Microservices stay maintainable in the long term. In addition, legacy systems can be migrated to Microservices without having to change the legacy code. Moreover, Continuous Delivery is easier to implement in Microservice-based systems. 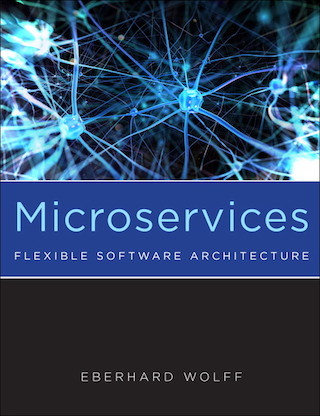 The book is translated from German, see http://microservices-buch.de. There is also a Korean translation. The book explains technology-neutral concepts and architectures which can be implemented with various technologies. As an example a concrete Java technology stack is shown with Spring Boot, the Netflix stack and Spring Cloud. On the basis of many examples and concrete scenarios you will learn how Microservices can be used as effectively as possible. You will also get suggestions how to deepen what you have learned through your own experiments. The book also contains essays by Microservices experts. thoroughly enjoying the book “Microservices” by @ewolff of @innoQ. definitely has a spot on my “must-read” list. For IT topics I usually prefer English literature, but I really recommend “Continuous Delivery” and “Microservices” by @ewolff.